Bentley’s OpenRoads Technology has brought with it brand new ways of creating and editing geometry. Built into the geometry elements themselves is the concept of “Design Intent” which employs “Civil Rules” that allows elements to remember the methods used to create them. So, for example, if you create a new linear element that is meant to remain parallel to an existing element, a civil rule is applied to that new element that instructs it to remain parallel to its existing parent element even if that parent is modified. Giving civil geometry elements a level of intelligence is a powerful capability that can potentially save a lot of time. But on large projects, the updating of these rules can introduce a small delay with every edit that you make. You might want to disable the processing of these rules and then let them update in batch after you have finished your design changes. There are a set of tools that can be used to manage the civil rules that are applied to elements. The user can enable and disable rules that exist on the current element as well as elements that reference the current element. Rules can even be removed altogether, effectively dumbing-down the geometry to be a simple MicroStation graphic element. Located on the context-sensitive pop-up menu that appears when hovering the mouse cursor over a civil geometry element, these tools provide easy access to manage each element’s civil rules. We’re going to look at each of the available tools and define how each of them operates. The first thing to do when trying to get a handle on these tools is to rely on the tooltip that appears over each one as the mouse pointer hovers over it. The tooltips are a bit more descriptive than the icon images themselves and will give you a little more insight into each tool’s name and function. Let’s take a look at each of the tools that are available for horizontal geometry elements below. Locks the selected element and deactivates the civil rules that define it. If the selected element’s definition is defined by referencing a parent element, edits to that parent will no longer result in a change to the selected element. The civil rule is still contained within the selected element and will be applied again once either of the Unlock tools is applied to it. Locks the selected element and deactivates the civil rule that define it as well as the rules attached to all elements that reference the selected element. If the selected element’s definition is controlled by referencing a parent element, edits to that parent will no longer result in a change to the selected element. The civil rule is still contained within the selected element and will be applied again once either of the Unlock tools is applied to it. Unlocks the selected element and re-activates the civil rule that defines it. If changes have been made to a parent element, the selected element will immediately update to follow its civil rule. This tool will not activate rules applied to any child objects that reference the selected object. If child elements reference the selected element, they will update only if their rules are also active. Unlocks the selected element and re-activates the civil rule that defines it as well as the rules attached to all elements that reference the selected element. If changes have been made to a parent element, the selected element will immediately update to follow its civil rule. Likewise, all child elements that reference the selected object will become unlocked as well and their civil rules will be applied. This tool is used to reassign the selected element’s parent to a different civil geometry element. 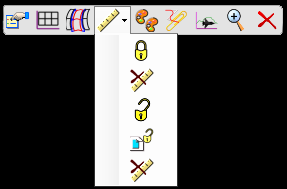 The tool is only available when the selected element’s rule references another civil geometry element. When activated, the tool will prompt the user to select the new reference (parent) object. When one is selected, the child object’s civil rule will be evaluated and the element will change to reflect the rule’s effects based on the new reference object. Note that any objects that reference the child object will be updated as well. Removes the selected object’s civil rule completely. Unlike deactivating a rule, removing a rule effectively converts the selected object to a simple MicroStation graphic element. Its civil object manipulators will be replaced by simple graphic object handles. Note that any civil geometry elements that reference the selected object will still reflect any changes made to that object, though the result may be unpredictable. Bob is a partner at EnvisionCAD and is an industry expert in the implementation, configuration, instruction, development, and customization of both MicroStation and InRoads. Is there a way to reapply a deleted/removed rule?